What will be the fate of these red-shirted Enterprise crew? NEW YORK — The original "Star Trek" series isn't just a milestone of science fiction, it's also a treasure trove of mathematical ideas — as Space.com discovered when we attended "Star Trek: The Math of Khan" at the Museum of Mathematics on Thursday (April 6). Tribbles, inevitable aliens and computer-breaking paradoxes all made appearances at the talk — along with the fate of those (evidently) not-so-ill-fated red-shirted crew. Connor Trinneer, who played Commander Trip Tucker on "Star Trek: Enterprise," introduced the talk, which was sponsored by the Simons Foundation. Then the guest of honor, James Grime, set the scene before launching into his math explanations. "'Star Trek' is a science fiction show, but there's no such thing as maths fiction," he added. "Surely, any maths that appears in the show should be on firmer ground, right?" Here are some of the many mathematical tidbits Space.com gleaned from the lecture. Grime first focused on an age-old assertion: that crewmembers wearing red shirts in the original "Star Trek" series, which denote working in engineering or security, are far more likely to be killed off than any other shirt color. 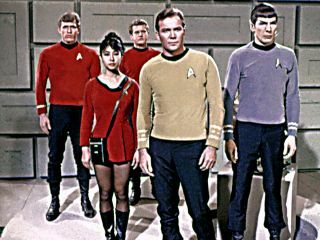 That claim, in fact, is false — more "redshirts" died on-screen than any other crew type (10 gold-shirted, which are command personnel; eight blue-shirted, who are scientists; and 25 red-shirted, Grime said), but that calculation fails to take into account that there are far more redshirts on the ship to start with than any other crew type. In other words, we're looking at the probability that you are a redshirt if you die (58 percent) — what we want to know is the probability that you die if you're a redshirt, Grime said. Grime used the "Star Trek" technical manual to find out how many of each crew type there were, which painted a different picture: out of 239 redshirts, 25 died, which is 10 percent. Out of 55 goldshirts, 10 died, which is 18 percent! So you are more likely to die as a goldshirt, Grime said. Grime also compared the Vulcans' mode of reproduction, which happens only once every seven years, to that of tribbles, whose numbers grow exponentially and reach great numbers very quickly. For instance, in "The Trouble with Tribbles," Spock calculates that after just three days there will be 1,771,561 tribbles! Because each tribble produces 10 additional tribbles every 12 hours, and the original tribble sticks around to reproduce more, the generations grow by 1+10 = 11 times each generation — giving 1 x 11^6 tribbles after six generations (three days). According to Grime, Captain Kirk talks computers to death no fewer than four separate occasions in the original series. The captain often achieves this feat using sentences similar to the "Liar's Paradox": "This sentence is false." It's a paradox because if the sentence is false, then the sentence is stating the truth, even though it is supposed to be false; if the sentence is true, then it must be true that the sentence is false. A similar statement powers mathematician Kurt Gödel's Incompleteness Theorem, which in effect proves there's a similarly paradoxical statement like "This statement is not provable" in any given mathematical system, Grime said. If the statement is true, it means there are true mathematical statements that can never be proved, like "holes" in mathematics. If the statement is false, it’s a contradiction, and that means there are contradictions within a mathematical system — so any system without any contradictions will also have statements that are impossible to prove. So something very much like Kirk's computer-busting paradox is something that appears in real mathematics. Chasing a similar question, the mathematician and pioneering scientist Alan Turing set out to find out whether it's possible to determine whether any given computer program will be able to solve a problem and halt or get stuck working on the problem forever. Ultimately, he proved that you cannot write another program to predict whether a program will finish or not — a result that suggests that you can't definitively determine whether a statement will ever be possible to prove, Grime said. "When you see in science fiction a computer being defeated by the use of a paradox, that's because that idea goes back to the original paper where the computer was designed, when it was theorized by Alan Turing — it goes back to the original paper itself," Grime said. So the incompleteness of mathematics, and the inability to solve the so-called "halting problem," is all for the best as far as android-dodging Starfleet crew are concerned. Mathematician James Grime presented "Star Trek: The Math of Khan" at the Museum of Mathematics in New York City April 6. Here, he discusses the Drake Equation, which details the likelihood of encountering a message from extraterrestrial life. Grime also talked about the Drake equation, which estimates the chances of encountering communications from an intelligent extraterrestrial civilization. Frank Drake takes into account the number of galaxies whose emissions are detectable from Earth, how easily life develops and becomes capable of communication and how many places throughout the universe are suitable for life, among other variables. Most of those variables aren't knowable yet, but plugging numbers in offers a potentially inspiring glimpse into just how common extraterrestrial life could be — originally, Drake and colleagues concluded there would be between 1,000 and 100,000,000 civilizations we could potentially detect. It certainly inspired "Star Trek" creator Gene Roddenberry, Grime said — he used it in his pitch for the show to justify the many alien species Kirk and crew encounter over the course of the show. Or at least he tried to use it — he made up his own, nonsensical formula, which came to be known as "Roddenberry's formula." Trinneer, the "Star Trek: Enterprise" actor who introduced the talk, chatted with Space.com afterward about the likelihood of alien life existing somewhere in the universe. He said he wondered about the distance to our nearest alien neighbors, which he assured were very likely to exist. "It would be wanton hubris to believe that it's not the case," he said. "Star Trek: The Math of Khan" will be available to watch online soon, and Space.com will certainly let you know when the time comes.